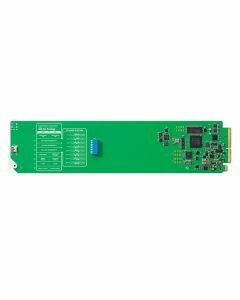 OpenGear Converter SDI/HD-SDI to Analog YUV/S-Video/Comp with D/Conv and AES/analog audio. Analog Video: Component , NTSC, PAL and S-Video from SD-SDI input. Component HD from HD-SDI input. Analog Audio: 2 channels of professional balanced digital with openGear standard 3 pin connections. AES/EBU Digital Audio: 2 channels of professional balanced digital with openGear standard 3 pin connections.